COBB Tuning High Flow Fuel Pump MITSUBISHI - Dezod Motorsports Inc - Home of the automotive performance enthusiast since 2002. AEM’s 320lph E85-Compatible High Flow In-Tank Fuel Pumps feature robust internal construction that is designed to withstand the low lubricity characteristics of ethanol and methanol fuels, and are tested to work with ethanol fuels up to E100, methanol fuels up to M100 and all types of gasoline. Its compact, short body design (65mm length) with mounting hooks also makes it ideal in universal applications that have fuel tanks with tight tolerances. The 320lph E85-Compatible High Flow In-Tank fuel pump includes a wiring harness, pre filter and O-rings. 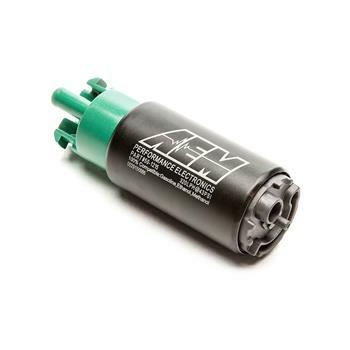 Every AEM 320lph E85-Compatible Fuel Pump is tested to flow 320 lph at 43 PSI before it is packaged for sale.